Custom retractable patio and deck awnings from the Dallas Awning Authority. We install both manual or motorized awning styles. Enjoy the outdoors without sacrificing protection, comfort or your budget with premium retractable awnings. We have both manual and motorized awning styles with fabric colors to match any decor. Shop our selection of Retractable Awnings from the comfort of your home. 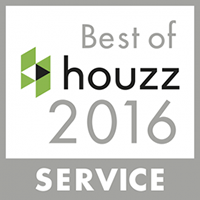 Schedule your FREE In-Home consultation today. Retractable awnings offer a long-term solution to create additional outdoor living space at a lower cost than standard roof construction. They also save energy which in return saves you quite a bit of money over time. We offer over one hundred solid and striped standard fabric colors. You surely will find a fabric to suite your taste and your home’s style. 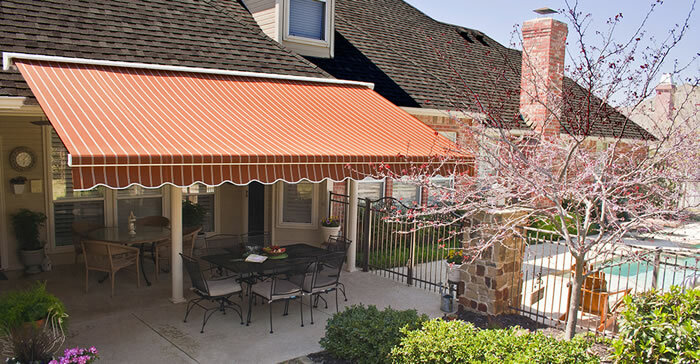 Our San Antonio retractable awning styles provide shade when you want it and practically disappear when you don’t. You can choose from manual operation awnings or motorized awnings. Our awnings are also available with remote control and wind sensors. Designed to keep you and your patio cool and custom built to fit your home. Sun block doesn’t have to come from a bottle … SPF 1000 without the grease! Designed to keep you and your family safe from the sun’s harmful rays, and keep UV rays from fading your valuable furnishings. Our San Antonio retractable patio awnings are also an efficient way to cool a home, reducing your reliance on traditional air conditioning. Research has shown that shading from an awning can reduce cooling costs up to 60%. Shade at the push of a button. Your remote control for the sun. An intelligent motor comes standard on our window awning products, so you don’t have to manually raise and lower the awning. 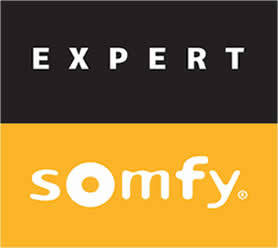 We feature motors and remote controls manufactured by Somfy, the world leader in tubular motors. 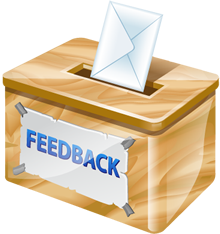 We’ve found that homeowners who purchase a motorized screen system are more satisfied with their purchase than those who don’t. Ours are the Superman of awnings, because the Man of Steel doesn’t rust! Weather or not… Your autopilot for climate control. The retractable awning comes standard with Somfy’s Eolis 3D wind sensor, allowing you to stay a step ahead of Mother Nature. The Eolis 3D wind sensor that will automatically retract your awning when the wind exceeds the pre-set threshold. 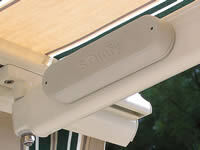 The sensor is battery-operated and is installed right on the front bar of the awning. Designed with strength and endurance for a lifetime of worry-free performance. Our awning is designed to break under the right conditions (high winds, with the awning extended). The technical term is “Planned Failure” and we believe in it because, well, it’s easier to replace a few awning parts than structural damage to your home. The ideal awning frame is strong enough to function efficiently. Durable enough to provide a lifetime of worry free performance. Intelligent enough to know when to stay open and when to retract. Graceful enough to smoothly open and close upon command. Small enough to be inconspicuous when closed. Our frame parts (the shoulders, arms, and bars) were designed and engineered to achieve this delicate balance, and protect your home as a result.